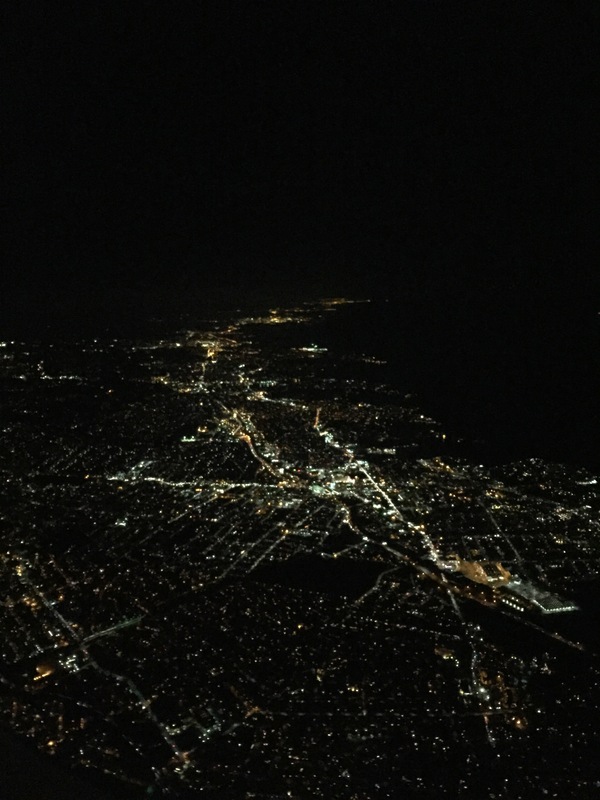 This is a review of American Airlines LGA MSP operated by an E175 from Republic Airlines. 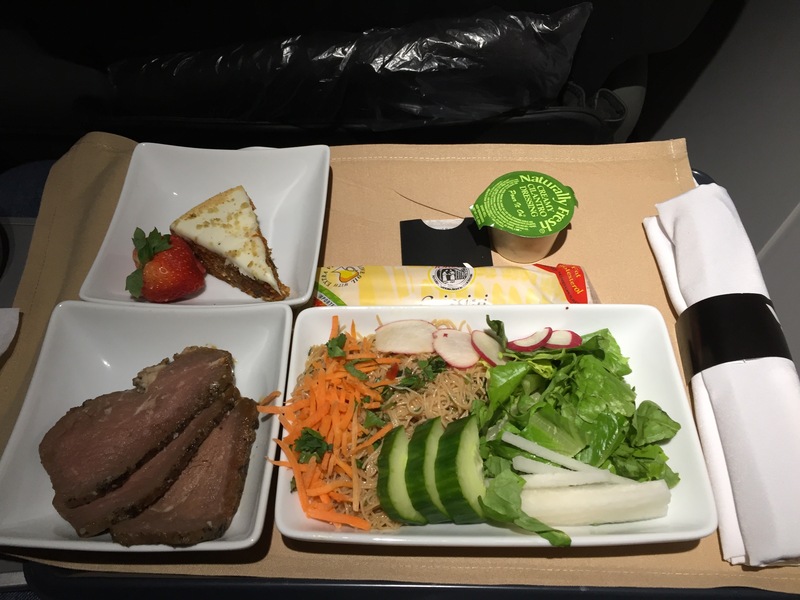 This report covers our return flight from New York to Minneapolis on American Eagle operated by Republic Airlines on an E175 aircraft. I received an email notification from American about one day prior to the flight indicating that I was upgraded. My wife and I used the app to adjust our seats so that we could sit together for the return flight. We arrived at the airport via UBER. We utilized UBER Pool and the fare ended up being about $22 and we did not end up having to share the ride with anyone else. UBER Pool is a great option for saving money on taxis. Sometimes you share the ride with others and sometimes no one else is matched up. If you haven’t signed up for UBER, you can sign up using my affiliate link and you will receive a discount off of your first ride. Upon arrival at the airport, we approached the American check in counter and found that there was no waiting by the self-tag area, so we utilized the kiosk to print our luggage tags. An agent assisted us when we arrived and he placed our tag on the bag as well as a Priority tag. The agent provided directions to the security line and he wished us a good light. We approached the line and found that there were only two other guests in front of us for the Pre-Check line. We entered the line and were able to go through security in about four minutes. 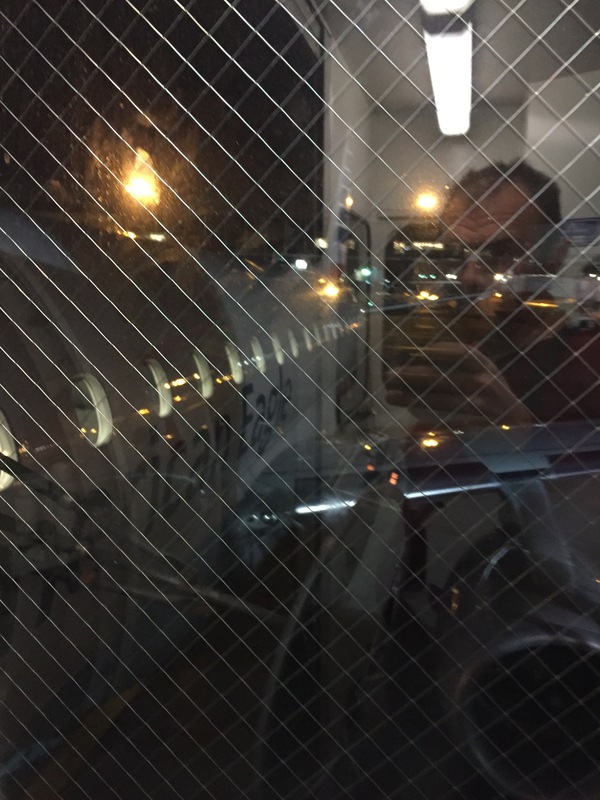 After making a visit to the Admirals Club located near the D gates, we took the bus over to the C gates, where our flight was scheduled to depart. 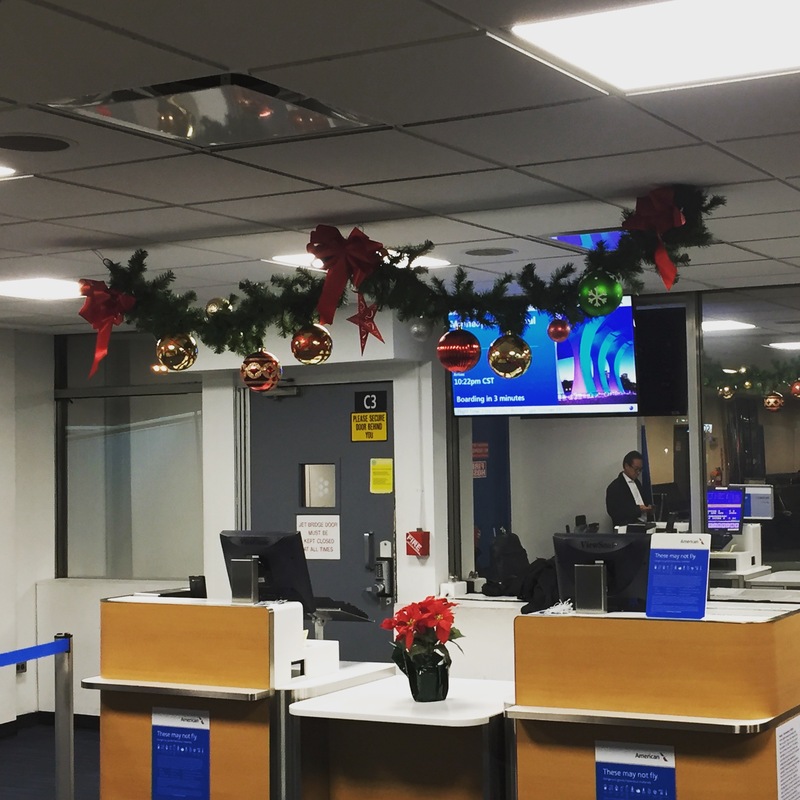 When we arrived at the gate, the activity level was light and we noted that the gate was decorated festively for the holiday season. At the scheduled boarding time, the gate agent made an announcement inviting guests in the first class cabin to board. We joined the line and were greeted within a minute by the gate agent who pointed to the scanner and once we scanned our boarding passes, he thanked us and invited us on the flight. We made our way down the jetway and were greeted by a flight attendant at the door. We located our seats in the second row and stored our bag above the seat. The flight attendant greeted us shortly after we were seated and offered a pre-departure beverage. We both requested a Dos Equis Beer. The flight attendant thanked us. A few minutes later she provided the beers in a can with a cup on the side. The flight attendant thanked us. Boarding was efficient and the door was closed early. The flight attendant prepared the cabin for departure and picked up our glasses and beer cans. She thanked us when she picked it up. The airplane made its way to the runway. 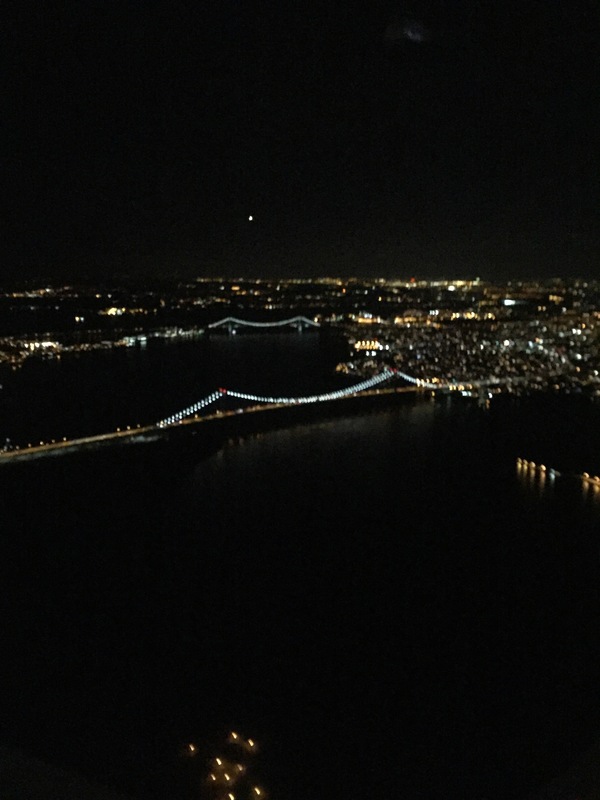 There was typical New York traffic and we ended up with about a 45-minute taxi before we were able to go up in the air. 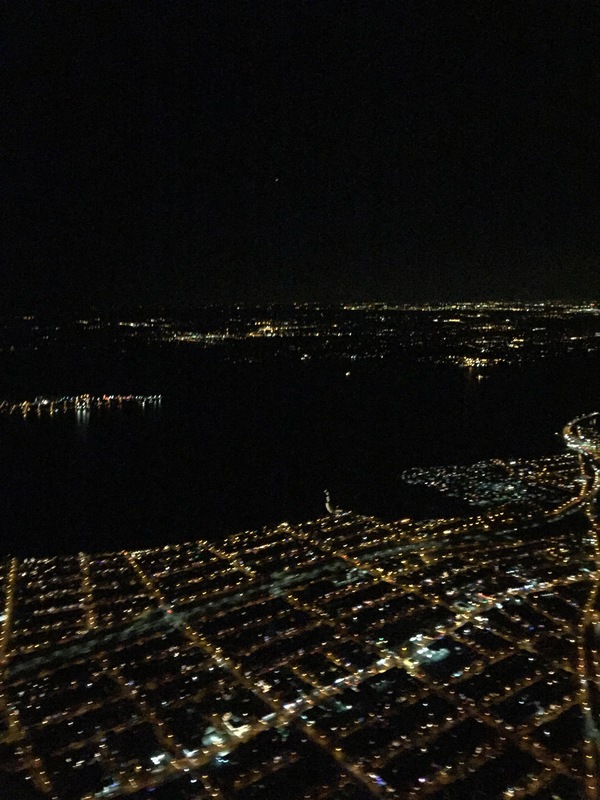 While the flight was climbing, I took a few pictures as we took over. As you can see, the lights from below looked cool against the black of the water drop. Shortly after we were at a cruising altitude, the flight attendant walked through the first class cabin and she asked what we wanted to drink during the flight. My wife and I both requested vodka cranberry and water. The flight attendant thanked us and she asked if we wanted dinner on the flight. We accepted and she offered a choice between a chicken wrap or a rice noodle salad with beef. My wife requested the chicken wrap and I ordered the rice noodle salad. The flight attendant thanked us. A few minutes later, the flight attendant provided a hot towel, which she picked up a minute later. 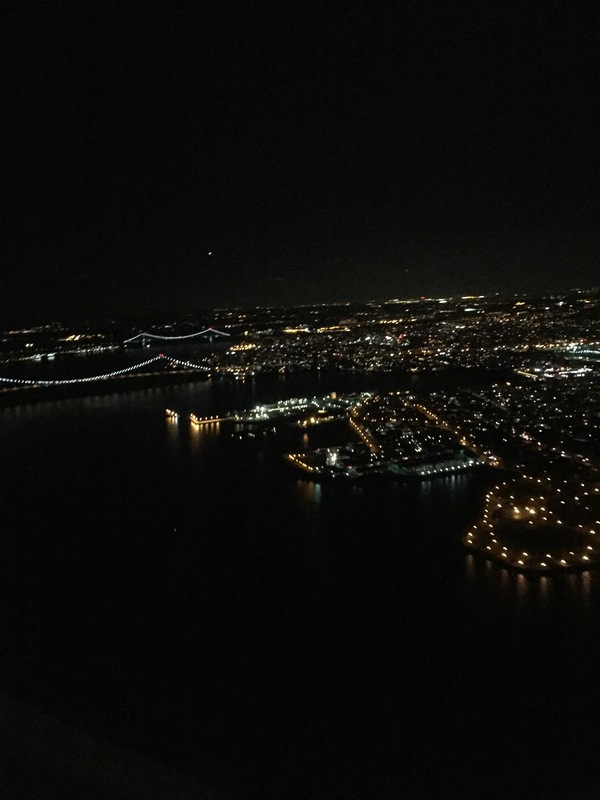 The flight attendant returned to our seats a minute or two later, and she apologized and she said that she discovered that the staff at LaGuardia did not stock any vodka on the flight and that they were out. We said that was not a problem and requested rum and diet. 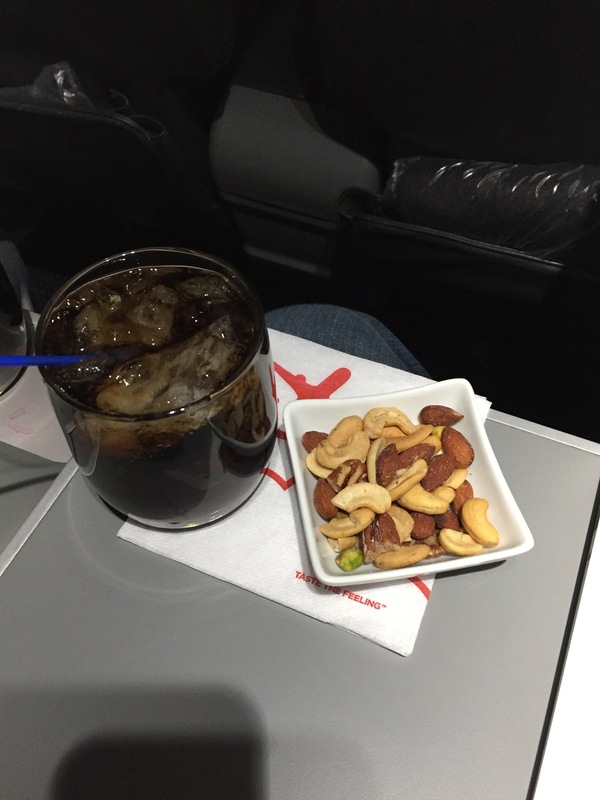 The drinks were served a minute later along with mixed nuts as an appetizer. The drinks were prepared well and the alcohol level was good. 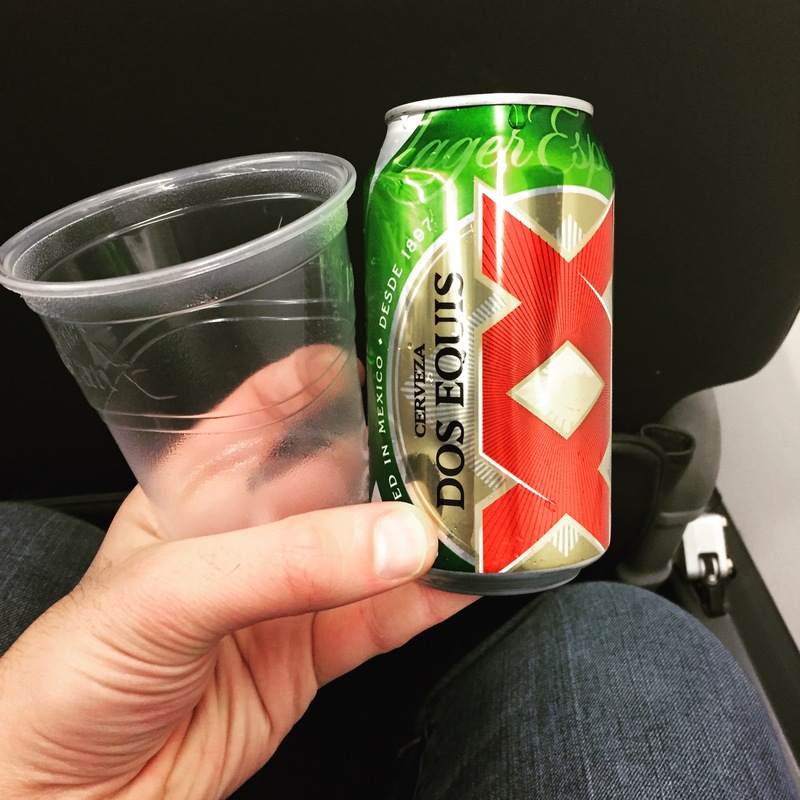 They were served in clean American Airlines branded glasses. Dinner was served about 15 minutes later. The flight attendant greeted us when she provided the tray and she asked if we needed anything else at that time. After we declined, she thanked us and asked us to enjoy. The chicken wrap was served with lettuce and vegetables on the side. The wrap was on fresh bread, chicken, corn and onions. The wrap had a good taste and flavor. The chicken wrap was served with a side salad with lettuce, tomatoes and peppers. The vegetables and fruit were fresh and had a good taste. Ranch dressing was provided for the salad and it was also fresh. The dish was served with carrot cake for dessert with a strawberry garnish. The cake was sweet and it had a good taste. The salad was served chilled with the beef on the side. The salad consisted of rice noodles with lettuce, cucumbers, jicama and a sesame dressing. The noodles were fresh and they were seasoned well. The vegetables were fresh. The beef was thinly sliced and it had a good taste and flavor. The meal was served with breadsticks and carrot cake. The breadsticks were fresh. The carrot cake had a good flavor and taste. The portion size was medium. The meal was presented attractively. After we finished our meals, the flight attendant picked up the trays and she offered additional beverages. I accepted and requested additional water. She filled the glass and thanked me. The flight attendant checked in with the passengers and she remained attentive throughout the flight. The flight lasted about three hours and there was a bit of minor turbulence so the seatbelt sign was lit for the majority of the flight. As the plane neared Minneapolis, the flight attendants picked up the cabin and prepared it for landing. The Captain made an announcement about arrival information before thanking everyone for flying American. The plane landed around the scheduled landing time and had a short taxi to the gate. Once we were parked, we exited the airplane and the flight attendant and Captain thanked us near the door as we departed. We made our way to the baggage claim area and waited for about 10-20 minutes before our bag was delivered. The flight was enjoyable. The meals had a good taste and flavor. 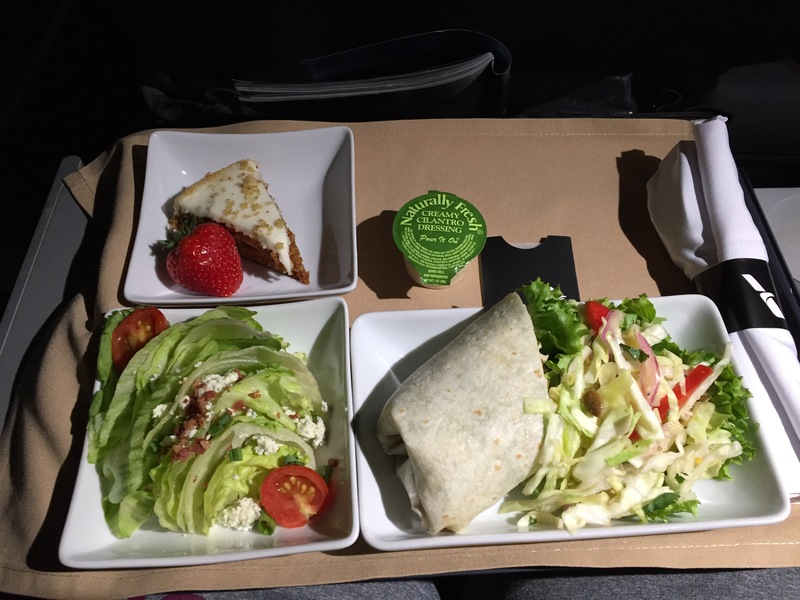 The menu was improved and the food tasted better than on previous flights. The flight attendant was friendly and attentive. We both looked forward to our next flight on American.